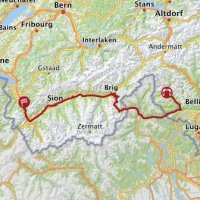 Wednesday, 14 June 2017 - At 222 kilometres, stage 5 is the longest stage in this edition of the Tour de Suisse. Travelling from Bex to Cevio the route takes in a huge intermediate climb over the Simplon Pass. Gigantic peaks like Wasenhorn, Monte Leone, Hubschhorn and Breithorn – or Simplon -, they all look down on the pass, which was crossed before in the 2012 Tour de Suisse in a stage to Verbier. Rui Costa soloed to victory, thus laying the fundament for his overall win in that edition. From Brig the climb up the Simplon Pass is averaging 6.6%. That’s steep as it is a 20 kilometres toil to the highest point at an elevation of 2,005 metres. When cresting the riders enter Italy for a 45 kilometres run on foreign soil. They tackle a 6 kilometres climb at 5.6% to the Piedmont mountain village Druogno. Once above there are 50 kilometres left to race to the finish line in Cevio, half of which is in descent. Stage 5 in the Tour de Suisse brings two intermediate sprints – at kilometre 200 and at kilometre 209.3 -, and both come with time bonuses of 3, 2 and 1 seconds. The first three riders on the line take 10, 6 and 4 seconds. Read also: results/race report 5th stage 2017 Tour de Suisse.